Iraq, in particular, has been the scene of a number of wars motivated by the West’s thirst for oil. During World War I, 1914-1918, the British captured the area (then known as Mesopotamia) from the Ottoman Empire after four years of bloody fighting. Although Lord Curzon denied that the British conquest of Mesopotamia was motivated by oil, there is ample evidence that British policy was indeed motivated by a desire for control of the region’s petroleum. For example, Curzon’s Cabnet colleague Sir Maurice Hankey stated in a private letter that oil was “a first-class war aim”. Furthermore, British forces continued to fight after the signing of the Murdos Armistice. In this way, they seized Mosul, the capital of a major oil-producing region, thus frustrating the plans of the French, who had been promised the area earlier in the secret Sykes-Picot Agreement. Lord Curzon was well aware of the military importance of oil, and following the end of the First World War he remarked: “The Allied cause has floated to victory on a wave of oil”. The British fear of US interest in Iraqi oil was soon confirmed by events. In 1963 the US secretly backed a military coup in Iraq that brought Saddam Hussein’s Ba’ath Party to power. In 1979 the western-backed Shah of Iran was overthrown, and the United States regarded the fundamentalist Shi’ite regime that replaced him as a threat to supplies of oil from Saudi Arabia. Washington saw Saddam’s Iraq as a bulwark against the militant Shi’ite extremism of Iran that was threatening oil supplies from pro-American states such as Kuwait and Saudi Arabia. In 1980, encouraged to do so by the fact that Iran had lost its US backing, Saddam Hussein’s government attacked Iran. This was the start of a extremely bloody and destructive war that lasted for eight years, inflicting almost a million casualties on the two nations. Iraq used both mustard gas and the nerve gases Tabun and Sarin against Iran, in violation of the Geneva Protocol. 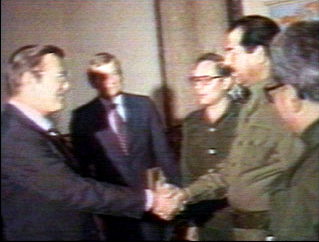 In 1984, Donald Rumsfeld, Reagan’s newly appointed Middle East Envoy, visited Saddam Hussein to assure him of America’s continuing friendship, despite Iraqi use of poison gas. When (in 1988) Hussein went so far as to use poison gas against civilian citizens of his own country in the Kurdish village of Halabja, the United States worked to prevent international condemnation of the act. Indeed US support for Saddam was so unconditional that he obtained the false impression that he had a free hand to do whatever he liked in the region. On August 6, 1990, the UN Security Council imposed comprehensive economic sanctions against Iraq with the aim of forcing Iraq to withdraw from Kuwait. Meanwhile, US Secretary of State James A. Baker III used arm- twisting methods in the Security Council to line up votes for UN military action against Iraq. In Baker’s own words, he undertook the process of “cajoling, extracting, threatening and occasionally buying votes”. On November 29, 1990, the Council passed Resolution 678, authorizing the use of “all necessary means” (by implication also military means) to force Iraq to withdraw from Kuwait. There was nothing at all wrong with this, since the Security Council had been set up by the UN Charter to prevent states from invading their neighbors. However, one can ask whether the response to Saddam Hussein’s invasion of Kuwait would have been so wholehearted if oil had not been involved. There is much that can be criticized in the way that the Gulf War of 1990-1991 was carried out. Besides military targets, the US and its allies bombed electrical generation facilities with the aim of creating postwar leverage over Iraq. The electrical generating plants would have to be rebuilt with the help of foreign technical assistance, and this help could be traded for postwar compliance. In the meantime, hospitals and water-purification plants were without electricity. Also, during the Gulf War, a large number of projectiles made of depleted uranium were fired by allied planes and tanks. The result was a sharp increase in cancer in Iraq. Finally, both Shi’ites and Kurds were encouraged by the Allies to rebel against Saddam Hussein’s government, but were later abandoned by the allies and slaughtered by Saddam. On the morning of September 11, 2001, two hijacked airliners were deliberately crashed into New York’s World Trade Center, causing the collapse of three skyscrapers and the deaths of more than three thousand people. Almost simultaneously, another hijacked airliner was driven into the Pentagon in Washington DC, and a fourth hijacked plane crashed in a field in Pennsylvania. The fourth plane probably was to have made a suicide attack on the White House or the Capitol, but passengers on the airliner became aware what was happening through their mobile telephones, and they overpowered the hijackers. Blame for the September 11 attacks soon centered on the wealthy Saudi Arabian Islamic extremist, Osama bin Laden, and on his terrorist organization, al-Quaeda. In a later statement acknowledging responsibility for the terrorist attacks, bin Ladin gave as his main reasons firstly the massive US support for Israel, a country that, in his view, was committing atrocities against the Palestinians, and secondly the presence of US troops in Saudi Arabia. Like Saddam Hussein, Osama bin Ladin was an ex-protegé of the CIA, by whom he had previously been armed, trained, and supported. The history of bin Ladin’s relationship with the CIA began in 1979, when the CIA, acting through Pakistan’s Inter-Services Intelligence Agency, began to train and arm the Mujaheddin, an international force of Islamic fundamentalists who were encouraged to attack Afghanistan’s secular socialist government. US National Security Advisor Zbigniew Bryzinski anticipated that the Soviets would respond by sending troops to protect the socialist government of Afghanistan, and he believed that the resulting war would be the Soviet Union’s version of Viet Nam: It would be a war that would fatally weaken the Soviet Union. 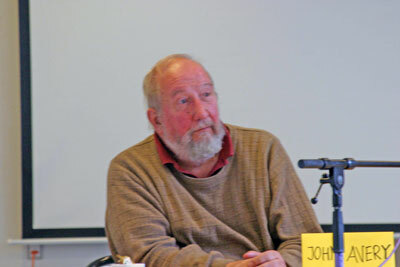 Thus he saw the war that he was provoking in Afghanistan as an important step in the liberation of Eastern Europe. “What is most important in the history of the world?”, Polish-born Bryzinski asked in a 1998 interview, “The Taliban, or the collapse of the Soviet empire? Some stirred-up Muslims, or the liberation of central Europe...?” It was, in fact, these same “stirred-up Muslims” who guided two hijacked aircraft into the Twin Towers on September 11, 2001. During the spring of 2003, our television and newspapers presented us with the spectacle of an attack by two technologically superior powers on a much less industrialized nation, a nation with an ancient and beautiful culture. The ensuing war was one-sided. Missiles guided by laser beams and signals from space satellites were more than a match for less sophisticated weapons. Speeches were made to justify the attack. It was said to be needed because of weapons of mass destruction (some countries are allowed to have them, others not). It was said to be necessary to get rid of a cruel dictator (whom the attacking powers had previously supported and armed). But the suspicion remained that the attack was resource-motivated. It was about oil. Looking at the present and threatend conflicts in the Middle East against the background of this history, must we not ask: To what extent are they too about oil?